Sale at Northcoast Artists Gallery! We’d like to thank all of our long-time customers who have come in to shop at Northcoast Artists Gallery this past year. We appreciate the fact that you support local artists! As an expression of our gratitude, our ANNUAL SALE starts today. You can find special deals throughout the gallery for the entire month of January. See some of what’s being offered in the post below! Happy New Year! Like many seasoned artists, Lisa Orselli delights in the unexpected. Although she went to art school with the intention of becoming a printmaker, after attending her first encaustic workshop some 15 years ago, she was hooked. Melting pigment into wax, adding layer upon layer, the unanticipated variations thrilled her. “It’s the element of surprise that keeps me engaged.” she says. Encaustics is an ancient method that was used by the Greeks. The word encaustic actually comes from the Greek word enkausticos, which means to heat or burn. The medium is made up of beeswax melted with a small amount of damar resin to make it hard and then pigment is added to make it usable as paint. The practice of using encaustics had virtually disappeared until Jasper Johns started using melted beeswax again during the 1950’s. Ever since, encaustics has experienced a steady resurgence. Typically when Lisa enters her studio she has a vague idea of something she wants to explore. She then goes through a long period of working with a special pen that enables her to draw with the wax. She’s enamored of making dots, building them up with many colors and then painting over them and then scraping the paint away to see what’s left behind. In the midst of this she’ll often add photographs, painting on them and arranging them into patterns. Like Hansel leaving a trail of breadcrumbs through the forest, Lisa leaves a trail of personal experiences on her waxy canvas. There are images of the many places she’s traveled to. The homes she’s lived in. The bits of tickets and maps and printed material that’s caught her eye. In it all, the natural quality of the polished beeswax is so very pleasing and Lisa’s small paintings are like little jewels, often small enough to hold in your hands. Each one is imperfectly perfect, letting the light come in and revealing a corner of the mystery that is Lisa Orselli. ​Come meet the artist at her show, Paper, Patterns, Places—Encaustics. It opens on First Friday, November 2nd, 5 pm to 8pm, at the Northcoast Artists Gallery in Fort Bragg, CA. ​Painting is a language onto itself, completely outside the realm of words, but every bit as valid. Mariko Irie is a skilled painter and she takes joy in the conversation her images convey. It’s this connection with the viewer that compels her to paint and feeds her passion. When she sees her art bringing happiness to others, she feels fulfilled. Mariko paints in both watercolor and oil, two very different mediums. The watercolors give her the delight and experience of surprise that occurs when putting pigment onto wet paper. While the oils exhibit a more physical and decisive expression, showcasing her strong calligraphic brushwork. Both her watercolors and her oils reveal an intelligence and simplicity that comes with years of practice. A life long artist, she was born and raised in Tokyo, Japan. In 1982 she moved to this country. She then courageously did the thing so many people say is impossible: She succeeded in living her life as a full-time artist. A hard worker, she paints everyday, and it shows. From across the room many of her paintings appear nearly photographic, while up close you can see all the variations and brush strokes. You can’t paint the world in this way without feeling a deep respect for your subject matter. You can’t capture a sunset in the way she does without loving the beauty of it in your core. It requires skill, yes, but it’s so much more than that. Her paintings embody not only the natural treasures that surround us here on the Mendocino coast, but also reflect her deep respect and love for her subjects. She paints the things that comprise her life, and shares them with others. Her remarkable work is collected internationally and she has won many awards. 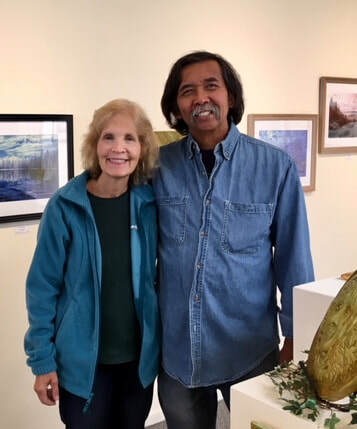 At Northcoast Artists Gallery she offers both originals and very reasonably priced prints, making it easy for you to take a little piece of Mendocino County home with you! I suspect that painting, not English, is her true second language, and she speaks it beautifully. Come see her show, Mariko Irie 2018. See what her paintings say to you. The First Friday Opening is October 5, 5pm to 8pm at Northcoast Artists Gallery in Fort Bragg. At its essence art is an alchemical process. Alchemy is a process of transformation. Have you ever thought about what clay might consist of? The rock-bones of the planet, stardust, ancient fallen leaves that have laid in creek beds. Grasses and vegetation. A baby's hair. Feathers and claws. All left for eons in wind and rain. Year after year, clay passively receives the blessings of sunlight and moonlight. This sticky, moist, earthy substance seems to hold all the world. And in the hands of artist, Satoko Barash, clay turns into something elegant again, rising up into lovely and often iridescent forms. Her pottery reminds us of all the living things from which it originated. This artist fully enters her work. She tends to each piece with love, etching delicate detailed designs, putting swirling spirals onto her plates—like whirlpools at the base of a a waterfall. Hold one of her cups and you are reminded of rolling hills, flowing streams, and sand dunes in a desert. Satoko throws her pottery on a wheel and then fires in a soda kiln that she built at her home. With this kiln, she achieves gorgeous color combinations from using soda ash. Spraying soda ash into the kiln during a firing the vapor travels through the air and chemically interacts with the clay, thus creating these wonderful patterns and colors on the exterior surface of each piece. The result is absolutely lovely. Why do we human beings respond to such beauty in the way we do? Because it restores a sense of possibility in us. In the presence of creative beauty, we ourselves are renewed. Good art brings us back to where we belong: to a state of wonder. In addition to being beautiful, Satoko’s creations are utilitarian! Cups to drink from! Plates to eat from! So let us feast on this life, my friends! Come see her show, Form and Surface. You won’t be disappointed. First Friday, September 7, at the Northcoast Artists Gallery, in Fort Bragg, 5pm to 8pm. There are love dogs no one knows the name of. Cliff Glover and Marion Miller just might be Love Dogs. They may not wag, but their hands certainly express their love and devotion to this world. Though their work is very different—one works in clay, the other in silk—they share a delight in nature, which is their source of inspiration. Together they live and work at home, in the coastal village of Albion. There they have a charming studio that is often open to the public. Both were introduced to the ancient tradition of the Japanese Tea Ceremony, Chanoyu, over 30 years ago. They were so fed by the beauty of this teaching, that it continues to give them nourishment to be true to their art and to life itself. When you see Cliff Glover’s work you’ll sense a natural rhythm in his pottery. It is as rich and alive as the earth from which it springs. The first time I picked up one of his bowls I was so pleased by the unexpected lightness. I thought, “This level of refinement comes from years and years of practice.” So it is. ​ Marion works in silk. Her scarves remind me of waterfalls and sunlight filtering through leaves. She uses the natural pigments of local plant materials and a traditional hand dying process. Her pieces have a lovely ethereal quality to them that seem to convey layers of awareness. These scarves are a pleasure to the touch. Maybe we are all Love Dogs. We long to merge with the beauty of this world. We hunger for the simplicity and elegance found in Nature. We hunger for signs of the eternal. And we are so grateful for the age old practices that center us and keep us steady when the waves come crashing down. If you sense you are a Love Dog, get your longing satisfied at this show where both tradition and new possibilities abound. While Marion’s scarves are as surprising and ephemeral as life itself, Cliff’s pottery is born of such an ancient art that it reassures. When you see their work together you’ll know: Life is good—life is of itself enough. Perhaps life might even be sustained through the creation of Beauty made with human hands and honest intention. Come see, and wag your tail at, Tea and Silk, opening First Friday, July 6th, 5 to 8 pm, at Northcoast Artists Gallery in Fort Bragg, CA. I’ll happily embrace any religion that expands my ability to love. If something strengthens me and brings me clarity and joy, I bring it close. I don’t care what it looks like, or where it comes from. That isn’t to say that I won’t take on a difficult practice, or explore deeply. I enjoy questioning any thought pattern of my own, or of any other persons—turning it round, and round, looking at it from every angle. I often find that kind of exploration fruitful and even life-changing. I try to let go of any ideas that generate sorrow or create feelings of separateness. I want to shed those parts and let them fall away like an old useless husk. I’ve come to believe that any dogma is a form of illusion that will just exacerbate all the troubles in the world. I trust in my own direct experience with the Divine. Those experiences come to me largely through dreams and creative acts. Mostly through painting, rarely through words. The paintings you see in this show, Strength in Tenderness, are like a visual trail through the last three years of my inner explorations. When I began painting the Sacred Feminine I felt the world open up. I felt--and still feel—a chorus of voices coming through me from my depths. Grandmothers, aunts, sisters, some that I’ve known, others that I’ll never know. They seem to want to be painted. They want to be loved and honored and they should be. It is my privilege and joy to portray them as best I can. So many titles came to me for this show: The Healing Circle, The Return of Magdalene, Holy Rascals, Recalcitrant Saints, Rebels and Mystics. Then one morning they gave me the perfect title: Strength in Tenderness. That is the message the Sacred Feminine is bringing to this beautiful injured world. Strength in tenderness is a desperately needed new concept that needs to be cultivated. It has nothing to do with dominance or cleverness. We will find our healing in our ability to be tender, in our ability to care for and nurture life. It is the powerful tenderness required to forgive, and forget, and begin anew. When I first held one of Lizzie Helbig’s lovely cups, a teaching of Martín Prechtel's came to my mind. Martín wrote, “Deep in our bones resides an ancient singing couple who just won’t give up making their beautiful, wild noise.” In Lizzie’s work I feel the essence of that human song he refers to. She creates by gently squeezing and pinching her clay into shape--she doesn’t use a potters wheel—so the entire surface of her pottery is infused with the touch of her fingers. It makes no practical sense to do something so time consuming as this, except that it clearly brings her joy. To me, this feels like evidence that she has found that ancient singing couple within herself. Whether or not I am right, Lizzie Helbig is doing her part to keep the world alive with beauty. She comes from a family who works with their hands. From her father, a machinist, to a German grandmother who is fond of tole painting. Raised in New Jersey, schooled in Vermont, Lizzie now finds herself settled in the village of Mendocino, where she is surrounded by the natural world. There’s something so timeless, yet unique, about her ceramics. Lucky for us, she loves making objects for everyday life. Her interest and love of nature’s patterns and the inherent intelligence found in thoughtful design are reflected in everything she does. 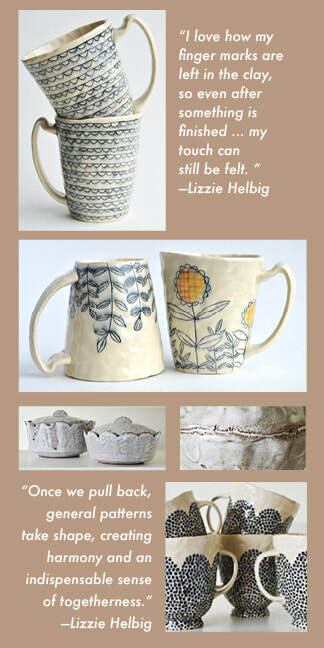 ​ Come see, and feel, Lizzie Helbig’s ceramics. Hold her work in your own hands. See if your fingers can hear that beautiful, wild singing. Her show, sunrise/sunset, will be on exhibit for the month of May, 2018, at Northcoast Artists Gallery. You can meet her at the First Friday Opening, May 4th, from 5 pm to 8 pm.